A durable, hygienic alternative to paint or ceramic wall tiles, Altro Whiterock PVCu walling systems provide a decorative, practical and hygienic solution. Benefiting from a watertight, seamless surface, Altro Whiterock is impervious, preventing water ingress into the substrate, thereby avoiding structural damage. It can be hygienically finished around fixtures and fittings. Unlike a tiled surface, Altro Whiterock does not require grout so the risk of contamination is dramatically reduced. The fully bonded system includes thermoformed pencil rounded corners giving bacteria nowhere to hide and making it easy to clean and disinfect. Its high durability and low maintenance costs make it an excellent long-term investment. Altro Whiterock antimicrobial PVC hygienic wall cladding revolutionises hygienic spaces, with its continual revolutionary kaleidoscope of coloured PVC hygienic wall cladding assists architects and contractors in delivering antimicrobial wall cladding solutions without compromising on design aesthetics. Altro Whiterock White is Hazard Analysis and Critical Control Points (HACCP) approved and is made from a high-quality, food-safe PVCu polymer that can handle temperatures up to 60°C. It meets all current European Union (EU) Directives on health and hygiene. This makes it particularly suitable for use in commercial kitchens. Altro Whiterock White is the timeless alternative to ceramic tiles for areas where hygiene and durability are paramount – like commercial kitchens, clinical areas, clean rooms and laundries. Use colour to subtly create a mood with Altro Satins. This versatile and sophisticated wall cladding is available in a range of solid, decorative, satin shades – from soothing and healing through to bright and energetic. Altro Satins still provides the impact resistance and hygiene you would expect from Altro Whiterock, with a stain-resistant, wipe-clean surface. Altro Satins can be combined with Altro non-sparkle safety flooring to achieve the required Light Reflectance Value difference needed for the requirements of the Equality Act 2010. When you want to make a bold statement, choose Altro Chameleon – the glossy, vibrant wall cladding that adds a touch of luxury to ‘high-end’ bathrooms, foyers, serveries, retail and splashbacks. Altro Chameleon is available in 16 high impact, high-design shades to add a little bit of affordable luxury to a range of environments. Offering all the benefits of Altro Whiterock, Altro Chameleon is very durable, with a smooth, watertight, wipe-clean surface. Seriously tough protection for walls, doors and corners, keeping interiors safe from impact and scuff damage and looking good for longer. Used in public areas where feet, bags, equipment and wheels are a constant, maintenance can be ongoing and costly, and cleaning difficult. Altro Fortis is a system that offers 2.5mm thick protection for walls and corners. It is perfect for education, health and retail where appearances matter. The Altro Fortis system keeps interiors safe from impact and scuff damage and looking good for longer. 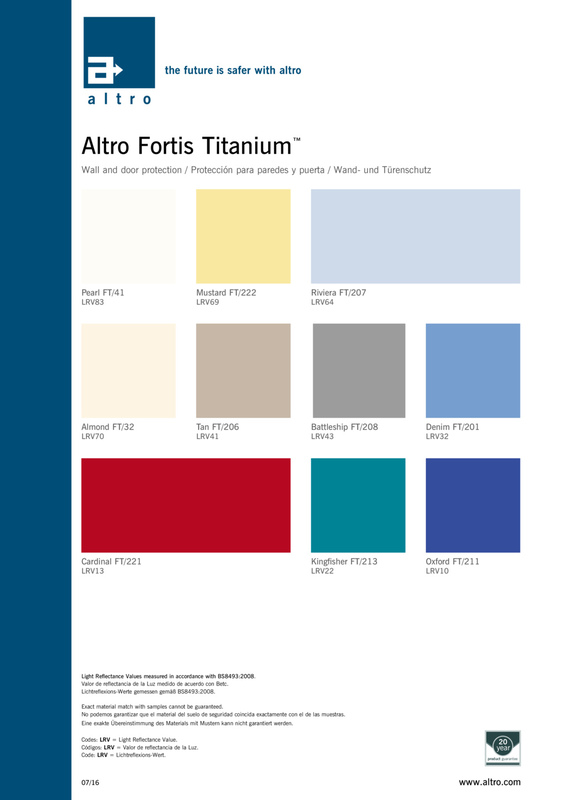 Available in ten colours, Altro Fortis Titanium matches many Altro Satins shades. This offers flexibility with design, making it a versatile solution across a range of areas. Altro Fortis can be used in conjunction with Altro 2.5mm safety flooring for an integrated tough and safe environment. It also works well with Altro Whiterock hygienic wall cladding, creating aesthetic consistency between hygienic and general areas. Contact us for a free no obligation quote or more information about our products and services.